Keep Calm and Carry On. The phrase is plastered on t-shirts, pillows and coffee mugs, but it’s tattooed onto the heart of every stage manager—keep calm and keep things going. I’ve heard it said that a stage manager, in addition to being a manager, is a friend, a parent, a therapist, a paramedic, a mediator, a police officer, a secretary and, in general, a knower of a little bit of everything. I’d say that’s a pretty accurate description. Auditions, pre-rehearsal week, tech week, and shows are whole other beasts with a slew of different responsibilities. Keep calm, keep on. A few times, someone has asked me about making a career out of stage management or theatre. My response is usually something like this: If there is anything else you can do that will make you happy, do that. It’s hard. I’ve never questioned if this is the path I should take, but it is worth warning those considering hiking it not to wear flip-flops. Stability, a steady income and a typical 9-5 work week do not get packed into your day bag. You have to be okay with being alone, with constant change, and with missing holidays, birthdays and weddings. It may not seem worth it, but for those that find that it is there are moments when you feel more alive and more in tune with humanity than you ever thought possible. When you watch an actor suddenly let go of fear after trying for weeks to become vulnerable enough to step into their character fully or when you hear cheers from the audience as a light cue you called brightens the stage at the perfect emotional moment; when you feel the rush of solving problems in split seconds and every time you become part of a family that will only last a brief period in your life. Is there anything else you can do that will make you this happy? Not a chance. 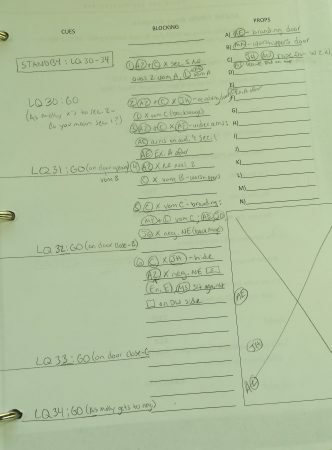 *The featured image above is a select page from the stage manager’s prompt book from Peter and the Starcatcher.